This Thai Curry Vegetable Soup is packed with vegetables, spicy Thai flavor, and creamy coconut milk. Ready in about 30 minutes! Prepare the vegetables for the soup and garnishes first, so they’re ready to go when needed. Mince the garlic and grate the ginger using a small-holed cheese grater. Peel and dice the sweet potato into one-inch cubes. Wash the bok choy well, then chop into one-inch strips, separating the fibrous stalks from the delicate green ends. Thinly slice the red onion and roughly chop the cilantro. Add the cooking oil to a large soup pot along with the minced garlic, grated ginger, and Thai red curry paste. Sauté the garlic, ginger, and curry paste over medium heat for 1-2 minutes. Add the diced sweet potato and chopped bok choy stalks to the pot (save the leafy green ends for later) along with the chicken or vegetable broth. Bring the pot to a boil over medium-high heat, then reduce the heat to low and let simmer for 5-7 minutes, or until the sweet potatoes are tender. To serve, divide the rice vermicelli among four bowls. 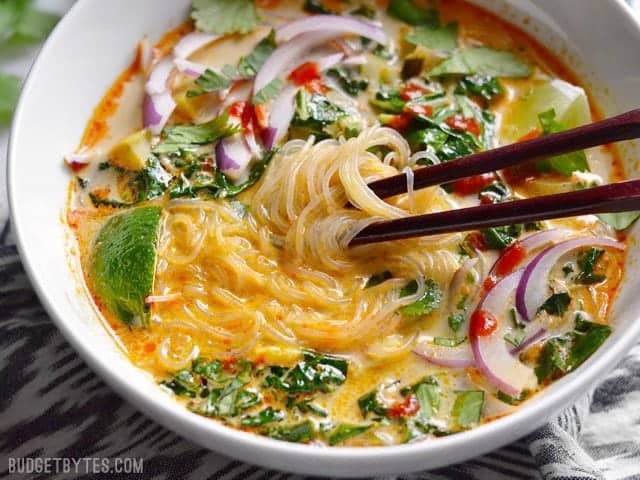 Ladle the soup and vegetables over the noodles, then top with red onion, cilantro, a wedge or two of lime, and a drizzle of sriracha. Power Strength Today in the Octane Studio at Fuel Fitness—let’s throw some heavy stuff around! You in? 12:10 See you soon! !